The giants of this season’s P1 class in the NEO Endurance Series have been Thrustmaster Mivano Racing. In the first four races, no one could quite put together a complete enough race to take them down. It would take a mixture of fast but clean driving, smart strategy, and likely a head-to-head battle with Mivano themselves to finally defeat them. Entering last Sunday’s 6 Hours of Spa, all indications were that Mivano was the team to beat yet again. 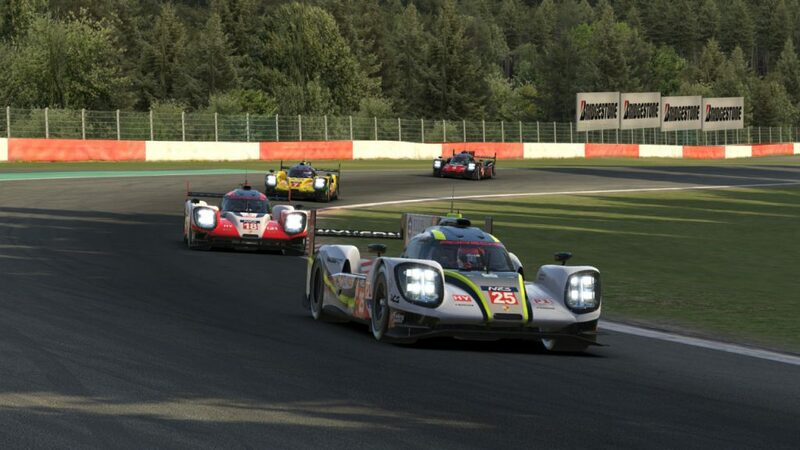 Marcus Hamilton gave them a three-tenth advantage in qualifying, although the usual suspects chasing them — SimRC.de and Porsche Basel by Sorg Rennsport eSports — were fourth and fifth on the starting grid, following Wyvern Racing and Race Clutch to the green flag. Mivano and the rest of the frontrunners made a clean getaway at the start, but that wasn’t the case further back in the P1 field. 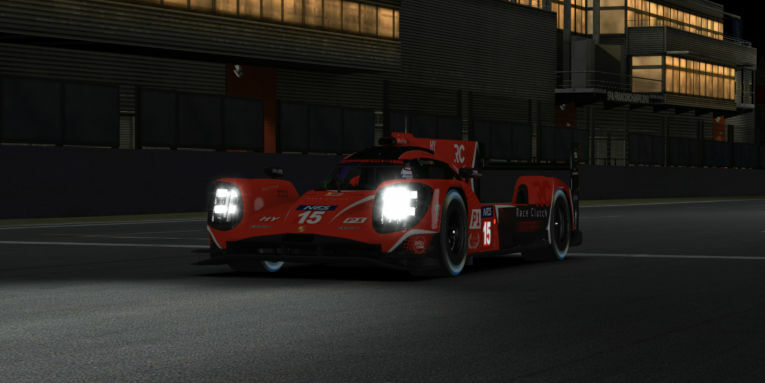 Contact between VRTeRacing, the UI1-Positive SimRacing #28 car, and Odox Motorsport sent VRT’s Ismael Yakubu sliding on his roof before his #20 Porsche 919 Hybrid even reached the starting line. One team moving forward on the first lap was Race Clutch. Richard Arnaud got past Wyvern’s Sai Andra to take second place down the Kemmel Straight and immediately began hounding Hamilton for the lead. The first two trips through slower-class traffic helped Hamilton stretch his lead, and a strategic decision to pit before the third encounter with GT traffic ultimately let their #3 entry open up a 16-second gap by the end of the first hour. Mivano defends against Race Clutch on the first lap into Les Combes, beginning a race-long battle between the two. While it seemed like the typical start of another dominating Mivano win, the first driver change of the race reversed that growing gap as Arnaud chipped away at Frederic Evers’ advantage, eventually leading to a lap-66 showdown in traffic that saw a risky move pay off. Shortly after that close encounter, Mivano pitted again and put the car back in Hamilton’s hands. After Arnaud’s race-opening quadruple stint, he handed off to teammate Luis Rodriguez, who found himself chasing Mivano due to their differing strategies. However, Race Clutch sensed they had an advantage if they could just keep pace for the rest of the race. While that flip-flopping battle was a focus of attention as the race neared the midway point, those two teams were by no means the only contenders. 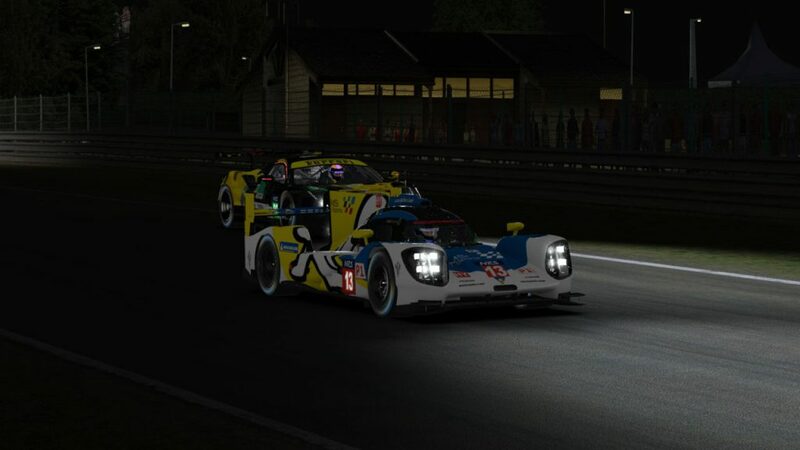 SimRC and Sorg both remained within 45 seconds of the leaders, and a mistake by either of the top two could have brought them firmly into the fight. Wyvern leads Sorg, SimRC, and Mivano’s #4 team through Blanchimont in an early third-place fight. Instead, though, Sorg found themselves on the receiving end of another team’s error with two hours to go. Michel de Jonge, driving the Wyvern car that fell from the top five after a pair of early crashes exiting Raidillon and Blanchmont, attempted to shift off-line exiting Courbe Paul Frère to give Sorg room to pass. However, he made that move across the track a bit too late, and Sorg’s Mike Nürnberg ran into the back of the #25 car, damaging the #18 Porsche. While Wyvern received a penalty for the incident — their first of two late in the race — it was little consolation to Sorg, which fell behind SimRC after a trip to the pits. It wasn’t the only contact for a P1 car on the day. 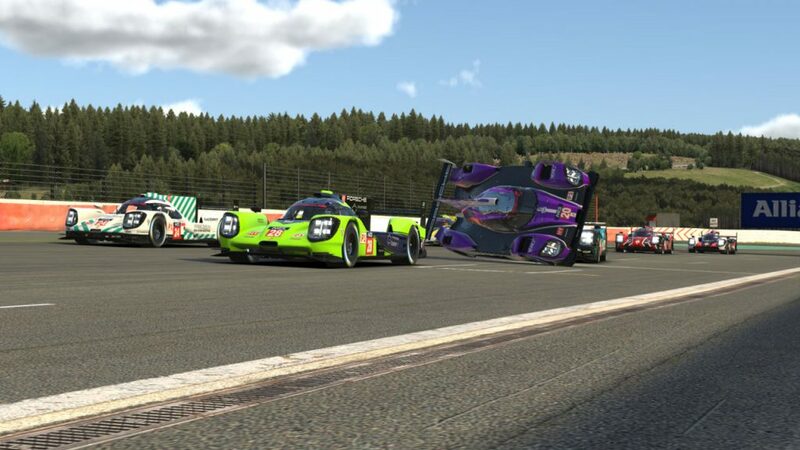 Odox was penalized for the start-line contact that sent VRT flipping, while Torrent Motorsports picked up a penalty for an early crash in GT traffic. 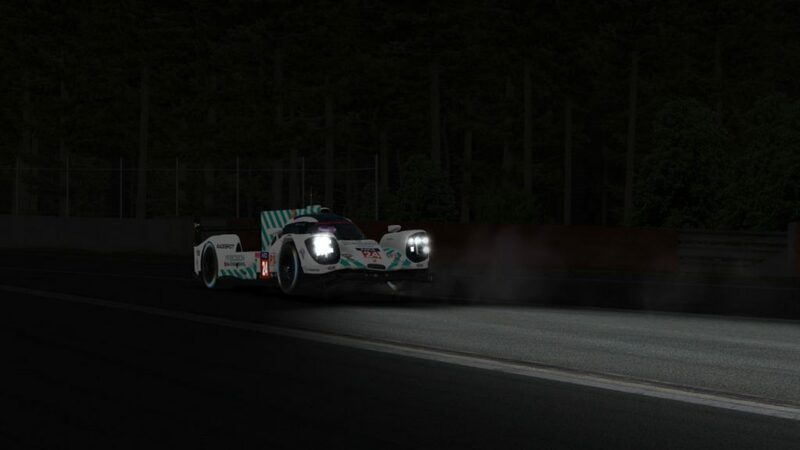 Positive SimRacing’s #28 team also suffered a pair of penalties for contact in traffic, and Team Chimera fell from top-five contention when Joshua Chin spun out of Raidillon and into the wall as the day-to-night race entered its final hour. That Eau Rouge-Raidillon complex proved to be one of the trickiest spots for P1 drivers. Mivano’s #4 entry crashed from fifth place on lap 25 when Maxime Brient had a tank-slapper coming up the four-story climb to the Kemmel Straight. Chimera’s Porsche slides after hitting the tire wall exiting Raidillon. While those teams salvaged what they could, the best battle in class was for the race victory. Mivano’s #3 team made its final pit stop with 39 minutes to go, and Race Clutch exited the pits for the last time with a half-hour remaining in the race. Balazs Remenyik held a 15-second lead, but Hamilton was quickly cutting into that gap by one to two seconds per lap. With three laps to go, the gap was under two seconds, and traffic ahead would either prove to again be Mivano’s advantage or finally deny them a chance at victory. As the two sped past the battling P2 leaders in Rivage and cut through GT traffic entering Pouhon, Remenyik had enough of a lead but almost didn’t make it back to the checkered flag. Remenyik and Race Clutch held on, crossing the finish line with Mivano less than a second behind to score their first NEO win and their biggest yet as a team. Remenyik leads Hamilton through La Source on the final lap. Their final margin will appear a bit more comfortable than it actually was. Mivano was handed a post-race penalty of 25 seconds — the equivalent of a pit lane drive-through — for Hamilton’s last-lap pass in traffic on the runoff beyond Paul Frère. 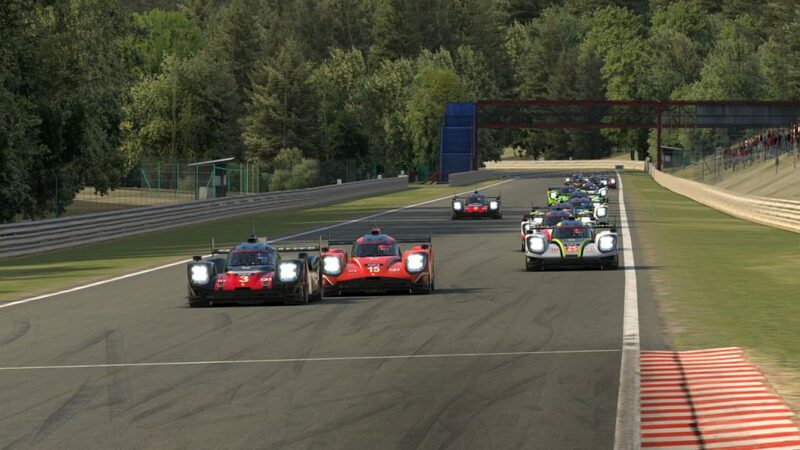 While they maintained second place and a comfortable 22-point championship lead entering the Le Mans finale, it was a difficult way to end their P1 winning streak and earn their third consecutive runner-up NEO finish at Spa. Sorg recovered from their damage to finish third and hold onto second position in the standings, while SimRC came home in fourth. MSI eSports ran a quiet but successful race, rising from seventh on the grid to fifth at the finish after a solid two-man effort from David Pérez and Alvaro Ramiro. MSI’s Alvaro Ramiro tackles traffic late in the race. 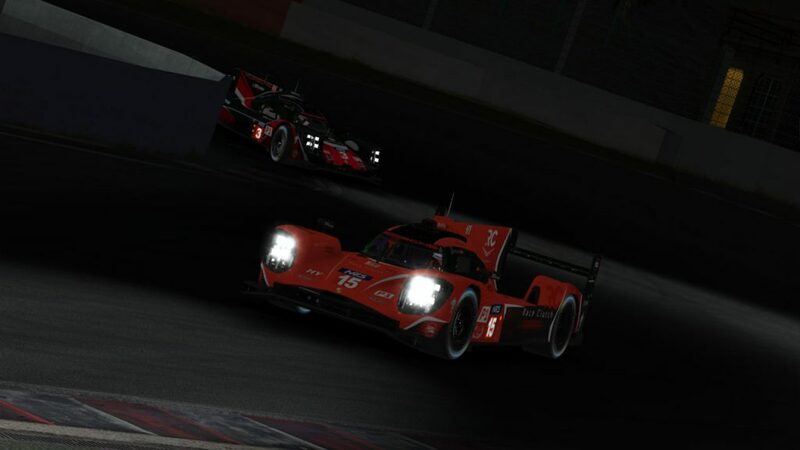 Despite proclaiming before the race that their underpowered Audi R18 e-tron quattro belonged in an “LMP1.5” class, Virtual Motorsport ran an impressive race, finishing only two laps down in sixth. They beat Mivano’s damaged #4 car, which was seventh. Chimera salvaged an eighth-place result after their late crash. SimatoK eSport gained a few positions due to attrition and finished ninth, while Positive SimRacing’s #28 team was tenth. The teams behind them all failed to finish. That included Wyvern, the Positive SimRacing #27 team that crashed before Blanchimont on lap 82, and Torrent Motorsports. The final three teams didn’t make it out of the first hour. Down on top speed after their early crash, Odox called it quits on lap 18. AVA Vervatic’s #23 P1 team lasted just 12 laps before they retired, while VRT had one of the shortest races imaginable before landing on their lid. VRT goes for a roll with an assist from Odox. A few teams never made it to the sunset at Spa, but for those that reached the dark of night, they were privy to — or a part of — one of the best prototype battles in series history that culminated in one of its greatest upsets. The rookie team from Race Clutch may not have been the most likely giant slayer, but they were the most capable. While many teams have tried copying Mivano to beat them, Race Clutch tried a “different approach in the strategy, but also in the setup,” according to Arnaud, and it worked — but just barely. It wasn’t quite a photo finish, but the Race Clutch team didn’t need cameras anyway. It was a result they’ll surely never forget.